Compact in size yet powerful in capacity, the MDE2400AYW dryer from Maytag is the perfect companion to any Maytag washing machine. Its flexible installation makes it a space saving alternative to other types of bulkier dryers and you can even stack it on top of the washer to save up on even bigger floor space. Backed by dependable performance warranty, with 13 dryer cycles and 3 temperature settings, this dryer is definitely a worthy long-term investment. - This dryer features flexible and simple installation. This means that it can fit almost in any place where there is free space, such us in tight corners, under counters, and even on top of the washer through its flexible stacking kit. - This dryer features a huge interior capacity despite its compact size. It can easily handle your average load on a daily basis and can accommodate up to 16 bath towels in one load. - This stainless steel dryer features powerful efficiency but is gentle on clothes, keeping them from wearing out too soon. - This product is backed by Dependable Performance Warranty. It means that you are buying a machine that has been tested for reliable performance and is supported by warranty. - This dryer has easy to operate electronic controls, which makes its simple for anyone to operate this machine and choose from its 13 dryer cycles and 3 temperature settings. The MDE2400AYW dryer from Maytag has an excellent range of advantages. First of all, it is space-saving due to its compact size, yet it features a large interior capacity. This means that the dryer can handle huge loads, even up to 16 bath towels for a single load. It is also known to dry efficiently, within a short period of time, due to its GentleBreeze drying system. Electronic controls make it easier to operate this dryer, as you can choose from different cycle options and various temperature settings. Aside from its compact size, external features of this dryer include a large door opening plus a reversible door. It also has a cool down option and an auto dry control. It has flexible leveling legs, stainless steel drum, and available in white color. 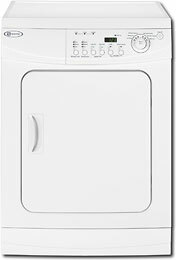 Some of those who have used the MDE2400AYW dryer from Maytag have reported some disadvantages with the machine. According to some users, the dryer takes too long in drying a normal load, and the dried clothes always come out more wrinkled than usual. Also when in the drying mode, some have noticed that the machine produces squeaky noises throughout the selected cycle. Comments for Maytag MDE2400AYW 13-Cycle Compact Electric Dryer 3.7 Cu. Ft.
You cannot put both sheets from our queen size bed in at one time, and even when put one at atime the sheet within only a few minutes rolls up into a very tight ball. So now I go back and check it many time during the drying cycle to pull apart. Most times I wait until the weather is good before doing the sheets. And there is an area at the front top of where round door fits in, that sometimes things like zippers and underware buttons get caught on that pulls or hangs thing up on. This has damaged some of the clothes. I use to enjoy when it was laundry day, because it was nice to get everything fresh and nice clean sheets for that night. Now I have to push myself to get this frustrating job done, because the problems with this dryer just gets me very upset. - not large enough for a family of more than 3 or 4. Remember the old Maytag commercials where the repairman is so bored all the time because the machines work so well that he never has any work to do? Well, for once the advetisers were dead on! I love my Maytag dryer! It is dependable, efficient, quiet and has not needed a repair or maintenence in the 4 years I have owned it. I live in a condo and have a small closet for my washer and dryer. This dryer model fits perfectly and is stackable with the matching white washing machine. I have owned other brands and models in the 20 years that I have been in my condo, and none of them stack up to this dryer. I had several problems with the washer/dryer combo before so I went with the stackable Maytags and haven't had to call the repairman yet. Poor, lonely Maytag repairman! The dryer is very easy to opperate and has a sufficient number of control choices, without being overwhelming like some brands. Dryness and temperature choices consist of High, Medium and Normal. There is a control dial to select from 6 drying cycles. The cycles are: Air Fluff, Damp Dry, Wrinkle Release, Normal/Auto Dry, Wrinkle Control and Delicates. Each cycle has a specified drying time (indicated on an easy to read digital count-down timer) which can be adjusted with a push of the Adjust Time buttons (More Time or Less Time). The timed cycles are energy efficient.